Minuscule Parisian Apartment Housed Man For 15 Years : The Two-Way The story of how a man lived in an apartment in Paris with less than 17 square feet of habitable space is being cited as proof of the city's absurd real estate market. The 50-year-old man paid monthly rent of 330 euros, or about $442, for the place he called home for 15 years. 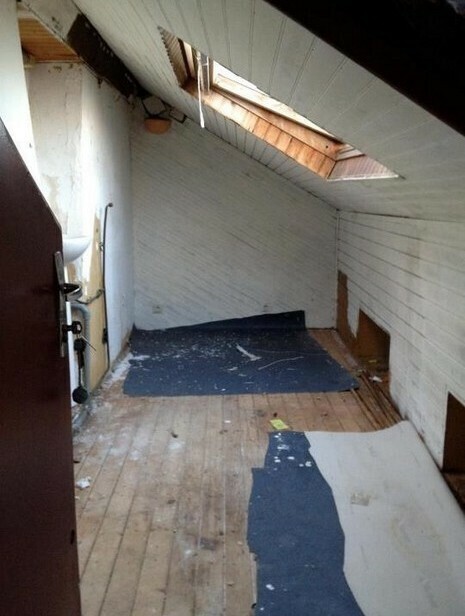 A photo shows the tiny apartment that a man rented for 330 euros a month in Paris. In France, news that an apartment measuring less than 17 square feet had been rented out for 15 years is being cited as proof of an overly expensive real estate market in Paris. A 50-year-old man identified only as "Dominique" had been paying rent of 330 euros, or about $442, to live in the apartment. The story was highlighted by the housing advocacy group Fondation Abbe Pierre, after the man asked for help dealing with his landlord. He had been living in an apartment whose habitable space was measured at 1.56 square meters — or about 16.8 square feet. RTL reported the story Thursday, saying that three different real estate agencies had managed the apartment despite its small size. It added that the door to the minuscule apartment was now permanently closed — and the owner faces a court date later this month. Le Monde reports that the legal minimum size of an apartment in Paris is 9 square meters. And it must include a shower. There's a good discussion going in the comments thread about why the apartment is said to measure just 1.56 square meters when the photo seems to show more "space" than that. As we said earlier, that photo may make the apartment appear larger than it really is. But, there also appears to be a legal issue regarding what the law in Paris says about how to measure the "habitable" space. Much of the apartment's space, it seems, isn't counted in that measurement because of the extremely low ceiling. "I did a little research and, while my french isn't very good, it appears they claimed it was only 1.56m² of 'habitable area' according to the loi Carrez, or Carrez Law. It's a french law that specifies any floor area under 5' 9" in height is excluded from the total footage. So 80% of the space in the photo is not included in the reported 1.56m². 'Flats in France are legally measured according the dimensions of habitable space - essentially the amount of room the tenant has to stand up straight without banging his head on the ceiling.' "
More contributions are welcomed in the comments thread.